It's official! 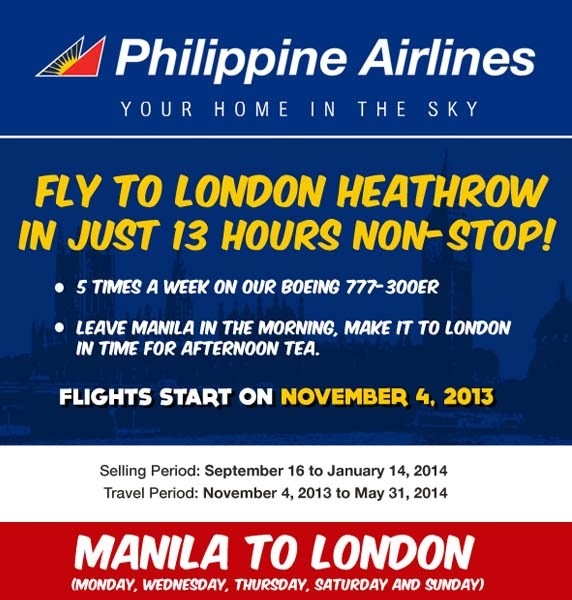 Philippines Airlines will start flying non-stop from Manila, Philippines to London, England on November 4, 2013. The airline has not flown non-stop to Europe in more than 15 years, and is already selling round-trip tickets at an introductory economy rate of $1,052 USD. Business class tickets start at $2,900 USD. Reportedly, they will operate five flights a week to London Heathrow airport, and will use their new twin-engine 370-seat Boeing 777-300ER aircraft for the route. The flight will only take 12.5 hours - about the same time it takes to fly non-stop from Manila to Los Angeles, California. For the inaugural flight, Ramon Ang, president of the airline, will be on-board and will also attend this year's World Travel Market there in London. The new flight route is expected to add a huge boost to the country's tourism, as more than 33% of the 349,000 European visitors traveling to the Philippines last year were from the UK. 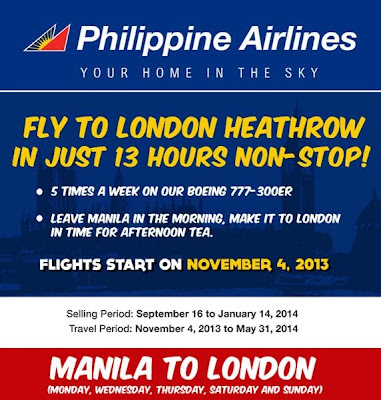 The airline is also planning to soon add non-stop flights to Rome, Amsterdam, and Paris.